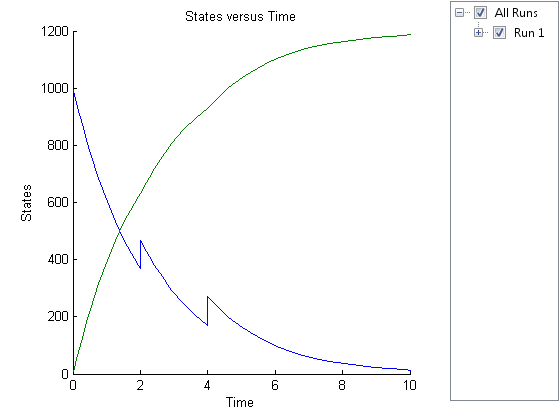 [time,x,names] = sbiosimulate(modelObj) returns simulation results in three outputs, time, vector of time samples, x, simulation data, and names, column labels of simulation data x. This function simulates the SimBiology® model modelObj while using the active configuration set along with its active doses and active variants if any. [time,x,names] = sbiosimulate(modelObj,csObj) returns simulation results using the specified configset object csObj, any active variants, and any active doses. Any other configsets are ignored. If you set csObj to empty , the function uses the active configset. [time,x,names] = sbiosimulate(modelObj,csObj,dvObj) returns simulation results using a configset object csObj and dose, variant, or an array of doses or variants specified by dvObj. [time,x,names] = sbiosimulate(modelObj,csObj,variantObj,doseObj) returns simulation results using a configset object csObj, variant object or variant array specified by variantObj, and dose object or dose array specified by doseObj. simDataObj = sbiosimulate(___) returns simulation results in a SimData object simDataObj using any of the input arguments in the preceding syntaxes. Change the simulation stop time to 15 seconds. Simulate the model and return outputs in an array. 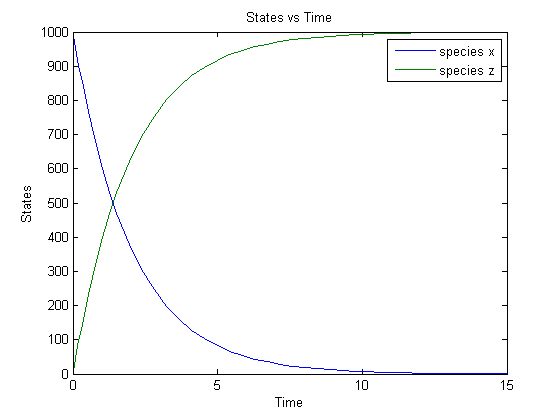 Plot the simulated results for species x and z. You can also return the results to a SimData object . Add two doses of 100 molecules each for species x, scheduled at 2 and 4 seconds respectively. 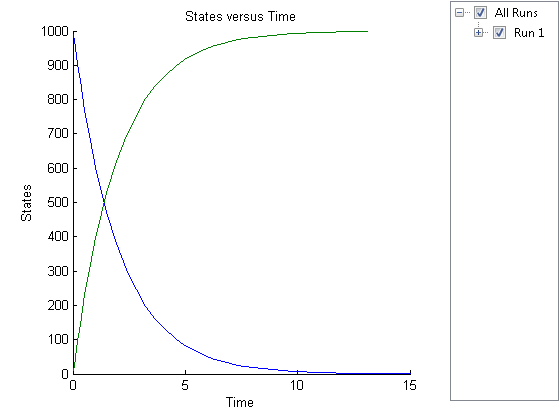 Simulate the model using no dose or any subset of the dose array. Simulate the model using configset and dose objects. Add a new configuration set using a stop time of 15 seconds. Simulate the model using the same configset, variant, and dose objects. Use the same order of input arguments as shown next. SimBiology model, specified as a SimBiology model object. 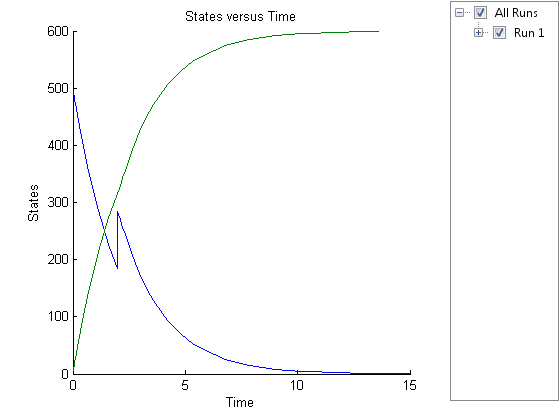 The model minimally needs one reaction or rate rule for simulations. Configuration set object, specified as a configset object that stores simulation-specific information. When you specify csObj as , sbiosimulate uses the currently active configset object. If your model contains events, the csObj object cannot specify 'expltau' or 'impltau' for the SolverType property. If your model contains doses, the csObj object cannot specify 'ssa', 'expltau', or 'impltau' for the SolverType property. Use  when you want to explicitly exclude any variant objects from the sbiosimulate function. When dvObj is a dose object, sbiosimulate uses the specified dose object as well as any active variant objects if available. When dvObj is a variant object, sbiosimulate uses the specified variant object as well as any active dose objects if available. Variant object, specified as a variant object or an array of variant objects. Use  when you want to explicitly exclude any variant objects from sbiosimulate. Dose object, specified as a ScheduleDose object , RepeatDose object , or an array of dose objects. A dose object defines additions that are made to species amounts or parameter values. Use  when you want to explicitly exclude any dose objects from sbiosimulate. 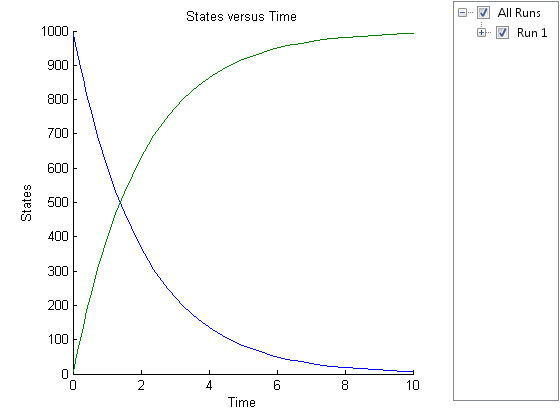 Vector of time samples, returned as an n-by-1 vector containing the simulation time steps. n is the number of time samples. 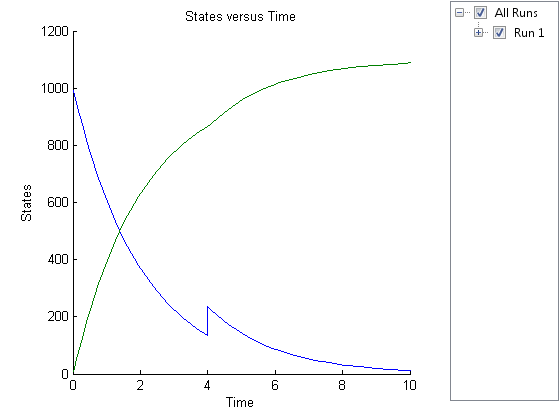 Simulation data, returned as an n-by-m data array, where n is the number of time samples and m is the number of states logged in the simulation. Each column of x describes the variation in the quantity of a species, compartment, or parameter over time. Names of species, compartments, or parameters, returned as an m-by-1 cell array of character vectors. In other words, names contains the column labels of the simulation data, x. If the species are in multiple compartments, species names are qualified with the compartment name in the form compartmentName.speciesName. 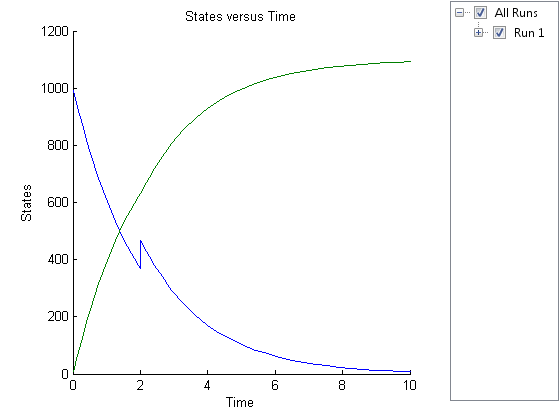 Simulation data, returned as a SimData object that holds time and state data as well as metadata, such as the types and names for the logged states or the configuration set used during simulation. You can access time, data, and names stored in a SimData object by using its properties.